An All-Ireland final rematch in Croke Park next Sunday looked likely for three-quarters of this tie, but that was before Waterford's injection of power burned Galway off. It left the Déise squad and supporters purring contentedly at the prospect of playing Limerick in what will be the first League final clash between the counties, while Galway returned home from Nowlan Park with much to contemplate before heading out on their championship adventures in seven weeks' time. Hopefully Joe Canning will be aboard, having taken a heavy knock off a thumping tackle by Kevin Moran late on. Canning was stretchered off with a groin injury and it now remains to be seen how serious it turns out to be. He was one of Galway's better players, but apart from Davy Glennon early on and near the finish, he lacked real support in attack. That's a concern to Micheál Donoghue, who will have been very disappointed by the manner in which Galway lost their way in the final 25 minutes. They started that phase three points ahead and with an extra man after Mikey Kearney had been sent off on a second yellow card in the 54th minute, but it was Waterford who ran the show from there on. They scored seven unanswered points before Galway pared two back late on. Donoghue put Galway's problems in that period down to poor choices. "In the first-half I thought we worked really hard and our decision-making was good. In the second-half, particularly after going down to 14 men, I thought some of our decision-making was poor. We had seven wides in a row and ultimately that probably cost us in the end," he said. Waterford wasted several good chances as well, but were so driven after Kearney was sent off that it often looked as if they, rather than Galway, had a numerical advantage. "Sometimes when you have momentum it can look that way. We knew we were in the game, we had just pushed ahead and in fairness when we get a chance like that, we've shown we know how to close out a game," said Waterford manager Páraic Fanning. 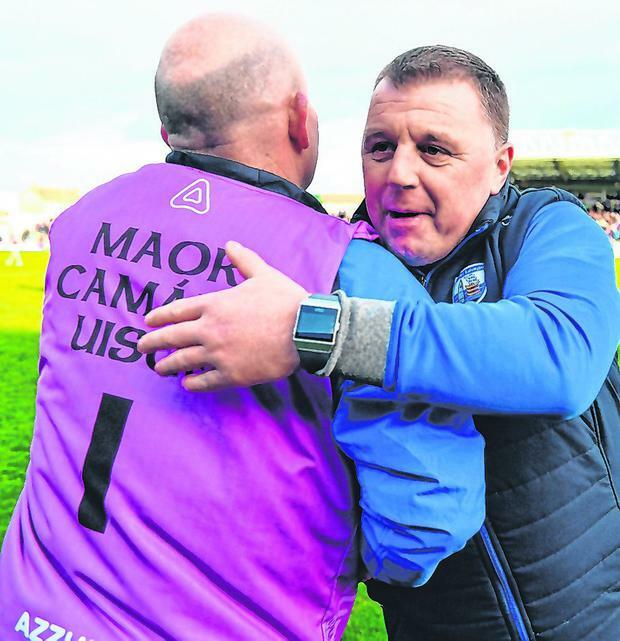 Taking his squad to Croke Park for a final is the best possible start to his managerial stint and while Limerick will be favourites to complete an All-Ireland and League double, Waterford are looking very much like a team for whom things are coming together very nicely. Yesterday's win, their second over Galway in a fortnight, was again fashioned on a refusal to allow their down periods undermine them. Four points behind after four minutes and five adrift after 32 minutes, they were lucky the situation wasn't even worse. It would have been except for a great save by keeper Stephen O'Keeffe from Kevin Hussey in the 26th minute. Still, Galway looked to be in a good position coming up to half-time, but the landscape changed significantly over the next few minutes. A goal from Stephen Bennett, whose long-range free flashed to the net through a thicket of hurleys, provided Waterford with a massive boost, cutting the deficit to two points (0-12 to 1-7) by half-time. 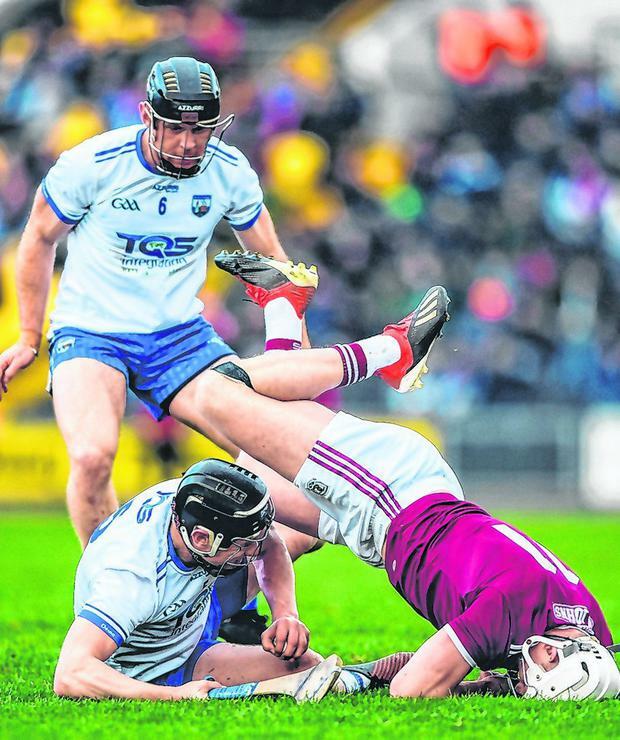 Galway extended their lead to three points twice in the opening 13 minutes of the second-half before heading into a drought after Canning scored his seventh point in the 48th minute. They didn't score again until seven minutes into stoppage time, by which time Waterford were four ahead and working intelligently to close out the game. Their performance with 14 men in the closing stages was hugely impressive. It called for huge physical endeavour as well as clever play to make sure that Galway's spare man was isolated. They hit both targets, even if the latter was aided considerably by loose deliveries by Galway. Their shot selection was poor too, misfiring several attempts from very long range when working the ball forward looked the better option. "Overall, I'm not going to fault them with their work and their attitude. Our agenda at the start of the League was to see if we could find a few players so we are happy enough going away now in terms of our championship preparations," said Donoghue. Fanning has another big engagement before turning his attention to the championship and with quite a few players still to return to the scene, the mood will be understandably upbeat for the Munster campaign. First, though, there's the Limerick challenge next Sunday in what promises to be an intriguing contest. "We'll be playing against the best team in the country in Limerick. They've shown how well they've responded to winning the All-Ireland last year and we know we have a massive challenge. But isn't it brilliant to be there," said Fanning. He was surprised by his side's sluggish start yesterday, but, crucially, it didn't tempt them away from their game plan, which ultimately came good. "We were expecting to start pretty quick. Maybe there was a little lack of energy early on, I thought we were maybe a little listless at times, but we kept working hard, which was very important," said Fanning. He is delighted with how the League has gone, not least in what it has told him about the attitude of his squad. "We've had a great winter. The lads have a huge capacity for work and I think there's more in them," he said. SCORERS - Waterford: Stephen Bennett 1-7 (1-6f), Pauric Mahony 0-3, J Barron 0-2, M Kearney, J Prendergast, A Gleeson, T Ryan, P Hogan, C Lyons 0-1 each. 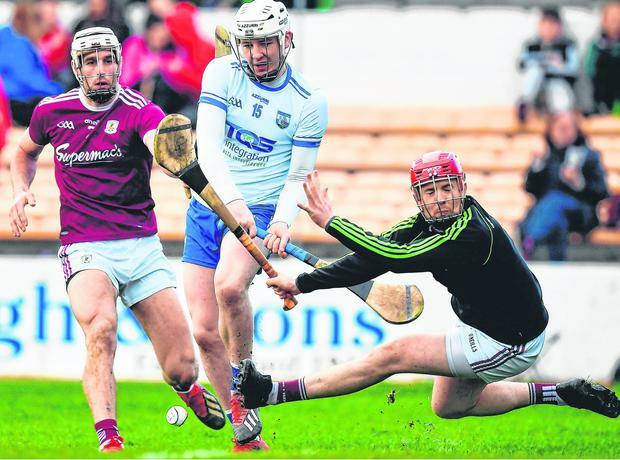 Galway: J Canning 0-7 (5f), C Mannion 0-4, D Glennon 0-3, K Hussey, J Coen, C Whelan, B Concannon, J Flynn (f) 0-1 each. WATERFORD - S O'Keeffe 8; S McNulty 7, C Lyons 7, N Connors 7; Philip Mahony 7, K Moran 7, T De Burca 7; J Barron 8, C Dunford 5; A Gleeson 6, M Kearney 6, Pauric Mahony 7; T Ryan 6, Stephen Bennett 7, Shane Bennett 6. Subs: J Prendergast 6 for Dunford (ht), P Hogan 7 for Ryan (51), C Roche 6 for De Burca (64), DJ Foran for Gleeson (70). GALWAY - F Flannery 6; P Killeen 7, R Burke 7, D Morrissey; 7 A Harte 6, P Mannion 7, G McInerney 6; C Mannion 8, K Hussey 7, J Coen 6, C Whelan 5, J Canning 8; B Concannon 6, N Burke 5, D Glennon 7. Subs: S Loftus 6 for Morrissey (45), J Flynn 6 for Burke (56), T Haran for Coen (68), J Mannion for Canning (72), J Hanbury for Killeen (78).